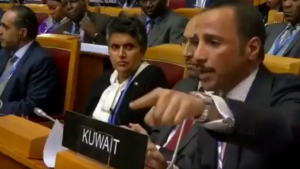 An Israeli delegation taking part in a conference in the Russian city of St Petersburg was forced Wednesday to leave the gathering after speaker of the Kuwaiti National Assembly accused them of being ‘child killers’. “You should take your bags and leave this hall. 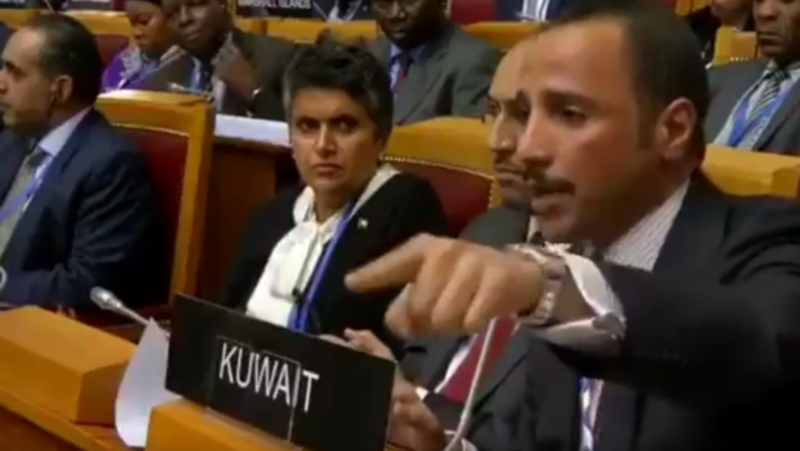 Leave now if you have an atom of dignity…you occupier, you child killers,” said Marzouk al-Ghanim in his speech at the Inter-Parliamentary Union Conference. The speech received applauses and galvanized Arabs across the Arab region. Across Qatar, Palestine, Kuwait and Saudi Arabia, Arabs took twitter to express their enthusiasm. “Honestly, Marzouq al-Ghanim represented Kuwait in the best way, to the point that his political rivals agreed with him,” said one user. Posted by KanelkaTagba on Oct 20 2017. Filed under Headlines, World News. You can follow any responses to this entry through the RSS 2.0. Both comments and pings are currently closed.